The National Archives The Swamp Angel was a 24,000 pound 8 in. 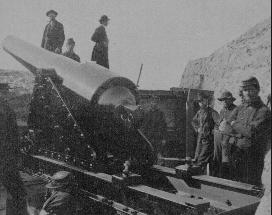 Parrott Rifle capable of firing 200 pound projectiles. It was mounted on an improvised platform in the marsh between James and Morris islands in Charleston harbor and was used to bombard the city of Charleston in August of 1863. The Swamp Angel fired only 36 rounds before its barrel breached, slightly injuring four of its crew. Although in practical terms a failure (the slight damage its 36 rounds causes was not at all proportional to the cost and effort of establishing the battery), the Swamp Angel did have a major demoralizing effect on the city's defenders. Gen. Beauregard (commanding the city's defenses) was outraged by the shelling and threatened severe retaliation. The actual barrel of the Swamp Angel is now mounted on a pillar in Trenton, NJ. Wise, Stephen R. Gates of Hell, Campaign for Charleston Harbour, 1863. (Columbia: University of South Carolina Press, 1994).